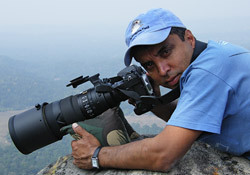 Munir Virani was born and raised in Nairobi Kenya. As a teenager, cricket took up most of his time. He was fortunate to play for one of the top cricketing clubs in Kenya for which the rewards for winning a tournament were usually a couple of nights in Kenya's elite game reserves and national parks. He utilized these visits to nurture and cultivate his interest in wildlife. He continued to play cricket with a great deal of passion, and with tours and competitions, Munir just managed to secure a place at Moi University for a Bachelor's degree in Wildlife Management. This was short-lived as he missed his cricket and decided to transfer to Nairobi University where he could study and play cricket at the same time. However, in 1990 when he was selected for the Kenya Cricket Team to represent Kenya in the ICC World Cup in Holland, he knew he had to make a decision and ultimately chose studies over cricket. He always maintains that this was the best decision he ever made. He graduated with First Class Honors in Zoology and was selected by The Peregrine Fund to train as a raptor biologist under the legendary Simon Thomsett. Munir registered at the University of Leicester (U.K.) and did his Master's degree on the endangered Sokoke Scops Owl. He successfully completed his Ph.D research at the University of Leicester (U.K) where his research focused on Augur Buzzards at Lake Naivasha. In 2000, Munir was sent to South Asia by The Peregrine Fund to evaluate the magnitude of declines of populations of Gyps vultures in the region. He set up a team of biologists and technical staff in India, Nepal and Pakistan and established a successful field and diagnostic research project that helped to identify the pharmaceutical drug diclofenac as the cause of the catastrophic crash of vulture populations there. Munir also directs raptor research projects in Africa. Munir is a member of the Board of Directors of the Raptor Research Foundation whilst also serving on Kenya's Bird Committee, the Raptor Working Group and Associate Editor for the African Journal of Ornithology - Ostrich. In 2002, Munir was awarded the Aga Khan Foundation award for excellence in the Field of Science and Technology by His Highness Prince Amyn Mohamed. He currently lives in Nairobi with his wife and two sons. His interests are cricket, squash, raptor watching and photography.